It was the 4th quarter and all the girls were cheering as loud,clean,smiling as they could. the girls were so loud you could hear them from all the way upstairs well at least the teachers could. The girls were so excited they won by 35 points 35-0 Lady Eagles! This pictures shows you HAVE TO HAVE spirit! You gotta be smiling, clean,loud when you cheer. Make sure when you cheer you are loud enough for everyone to hear you. For stunting you have to have a flyer,2 bases,1 back-spot and sometimes you can have side spots but be careful you can always drop them when you don't want to. You NEVER EVER want to drop them. 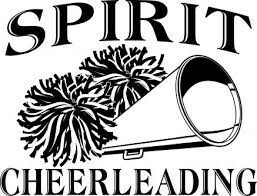 Some cheerleaders have to practice everyday from 2:00 to 9:00 PM at there school everyday. Most NFL cheerleaders squad are part time job. Often, cheerleaders have completed or are getting a university. This picture should tell you in your brain that Gabi Butler cheers for for 2 teams and this is her stunt on the right! My person is Gabi Butler and her info is Birthday: January 16th, Birthplace Florida, Age 17 years old, Birth sign Coprincorn. She is the #1 cheerleader. She has been cheering sence she was 8 years old. She is known as the flexiblity as a flyer and her strong tumbling skills. This picture is to show you what Gabi Butler looks like! Most cheerleaders start cheering in 6th grade and got and got brand new uniforms and actually first time cheering. As a part of the tryouts process, prospective cheerleaders are weighed with figured serving as a baseline at least for some days. All the cheerleaders start to go home and get ready to eat at the pizza place in Chicago.